Taking a day out with the family is a great way to create wonderful memories they will have for a lifetime. Those days out provide you with the perfect opportunity to relax, do something a little different and fun and also spend some quality time with each other. Before the warm weather sets in get everyone to try on their swimwear to make sure that it all fits. If it does not or is looking a little worn just replace it. Something that you can easily do online using a retailer like Fashion World. When you shop online you get a great choice of tankinis, swim dresses, bikinis and one-pieces. Get everyone’s sun hats, sunglasses and summer footwear out too and make sure it is all still fit for purpose. Again, replace anything that has seen better days. Doing this now ensures that you already have everything you need for an impromptu day out at the beach in the house. If the roads are busy, even a short trip can turn into a long one. So, it is wise to pack some snacks and keep them in the front of the car with you. These snacks that I reviewed a while back are a great example of the type of thing you need. They are healthy, filling, provide plenty of energy and are not affected by the heat. So, keep something like this at the back of the cupboard, so you can just grab it when you fancy treating everyone to an impromptu day out. You should also take a few bottles of water. It is also wise to fill a large thermos flask and put it in the boot of the car. Because it is in a container that is not going to be affected by the heat you can leave it there, so you will always have some extra water to use if you end up breaking down. You should never drink water from plastic bottles that have been left in the car. This article explains why that is such a bad idea. Get a large bag and put items that you need for a day out into it. That way if you wake up to a lovely warm day you can just grab it add a few bits and pieces and be out of the door in no time. The more items you leave in that bag the less you will need to pack. Keeping a short list of the additional items you need to pick up from around the house to be ready to go will help you to get ready quickly and make sure you do not forget anything important. 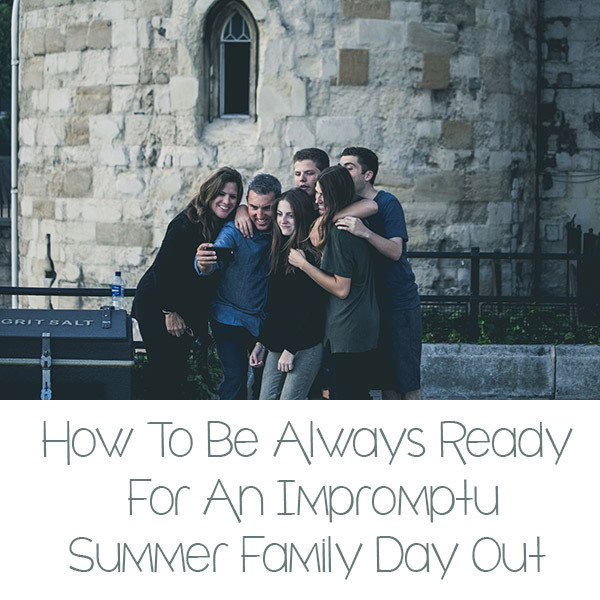 If it is the end of the month, paying for impromptu trips like this can be a bit tricky. One way to do it is to pop all of your coppers into a pot. Periodically, get the kids to count it up, put it into bags and take it to the bank. They will then credit your account. You can either spend it from there or transfer it across to a pay as you go card, which you keep in your special days out bag. Taking this approach will help to ensure you do not spend it on other things instead.